Happy Monday everybody! If you read my last post, you heard my side comment about my dream of opening a food truck. Many of you were intrigued by this, so I figured I would share a little bit about that with you all. I just love the idea of food trucks, being able to go where ever you want, the beach, a ski resort, main street, etc. I also love the fact that once you have made enough money you can pack up and go. Gives you time to do other things that you love. I would want to have a sandwich food truck; I love sandwiches. I think there are just so many possibilities and ways to be creative. My sandwiches would be super unique and out there, with the option to build your own as well. So there is a little bit about my dream of owning a food truck, haha. And yes, the squash are back. You didn’t think that winter was over yet did you? I haven’t posted many spaghetti squash recipes, only my Spaghetti Squash Casserole and Spaghetti Squash Cake (which is to die for!). 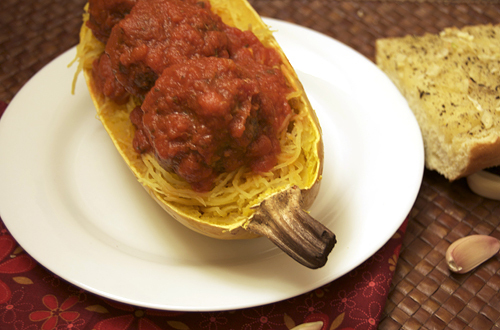 Spaghetti squash is also a great heathy substitute for pasta. This recipe is easy to make on a weeknight (like tonight!) and has a great presentation. My ski bum friends actually said they preferred the crunch of the spaghetti squash over regular spaghetti and meatballs! Test this one out with your friends/family and see what they think! Cut spaghetti squash into halves and bake at 400F until soft (about 30-40 minutes). Meanwhile, combine the ground beef, egg, bread crumbs, basil, thyme, salt, pepper, cumin and paprika in a medium bowl; mix until meatball mixture is formed. Roll the ground beef into 1 to 2 inch balls and place on a well greased baking sheet. Bake along with the squash at 400F until cooked through (about 20 minutes). Once the squash is roasted, use a fork to pick the squash in its shell; this will create the spaghetti strands. Top with meatballs and marinara to serve. Add parmesan cheese if desired. To be honest, when food trucks first debuted en mass across the country, I was definitely opposed to them. I thought they would be just a fad and quickly flop, but the more I look at them, the more they have to offer. In fact, I’ve done a complete flip and am in the same boat as you… actually pondering the feasibility of starting one myself! I like that you can just pack up and go, move around anywhere you please. If I ever had a food truck, it would be savory ice cream. They definitely are growing on me! I wish that food truck would have been popular when I was growing up because I probably would have had one. The hubby and I talked about a little restaurant, but we knew it would tie us down too much. A food truck would have been perfect. Keep dreaming Girl! 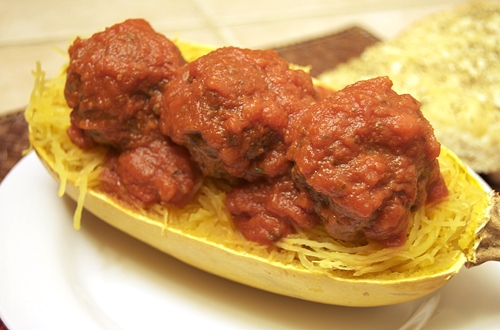 I’m always fascinated with spaghetti squash and love the way it turns spaghetti and meatballs into some special. Love this dish!!! Jenny, it was great to hear more about your food truck dream! Maybe a meatball sandwich is in order with this fabulous recipe? (With spaghetti squash slaw?!) So many possibilities… go after them, girl! Please keep us posted on your food truck dream! I love it! I also love your presentation of this dish. I love this!! The photo is great and the concept even better. We have been talking about food trucks for ever…love the concept and there are so many imaginative chefs on the road now. i’m making this for dinner tonight i hope my daughter likes it….